On weekdays, when we are closed, between the hours of 6.30pm and 8.00am, weekend days and nights, and on Bank Holidays, services are commissioned by NHS Nottingham City and your healthcare needs are covered by the out of hours medical services. 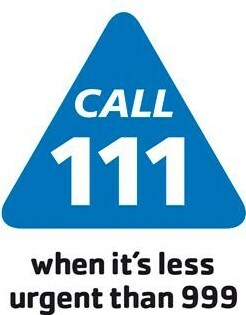 If you or your family need urgent medical care when the surgery is closed please phone 111. Your needs will be assessed and you will either be given advice or arrangements will be made for you to be seen by a healthcare professional. There are also a number of walk-in centres available. Your local pharmacy can also offer you advice and treatment if required for a range of minor ailments. Under the Pharmacy First scheme, if you are exempt from prescription charges, you will be able to get the same medicines the G.P. would have prescribed free of charge for head lice, temperature/fever, sore throat, ear ache, teething pain and pain relief for toothache. To access this service go to your local ‘Pharmacy First’ pharmacist.